Every homeowner knows, when it comes to their carpet, accidents happen. Things get spilled, kids get sick, pets have accidents. It’s a part of life. However, you don’t need to live with the carpet odors that are a result of these accidents. The problem is that even when you have your carpets professionally cleaned, these smells can linger. So, the question that needs to be asked is how do you remove bad smells and odors from your carpet? 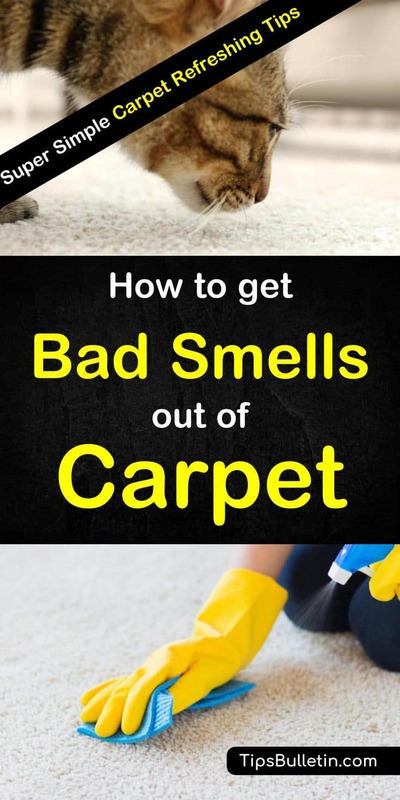 Here are several inexpensive and simple tips on how to get the smell out of the carpet, from pet urine to mildew. When your carpet begins to smell, it is usually the signal that you have mold and mildew growing in your carpet. These nasty organisms latch on to the areas of your carpet that are moist, whether because of the humidity in the air or because it didn’t get completely dry the last time you cleaned it. Pet urine and waste are just as notorious because their scent sticks to the carpet fibers. Here are several tips for removing carpet odors and a few homemade carpet deodorizer recipes to help get your carpet smelling great again. There are a ton of natural remedies for removing bad smells from your carpet, many of which you probably already have in your pantry and bathroom. Acidic products, like white vinegar, help to eliminate bacteria and the odors they cause. Mixing acidic household products with water will create unbeatable cleaning products. Here are some other tips for getting smells out of your carpet. Baking soda is the leading product for odor removal. It is made of sodium carbonate, which is excellent for removing everything from those offensive pet odors to mildew smell. For your area rugs, mix the soda with a bowl of water. Apply the solution to both sides of the carpet. Rinse the solution with soap and water and let the rug dry under the sun. The heat will remove any remaining odor and bacteria. To remove the odor from your carpet, sprinkle the baking soda directly on the carpet fibers. Leave the soda on for a couple of hours before vacuuming up the dirt. It is the best way to clean carpet without a machine and will leave your carpet smelling fresh. White vinegar is a highly acidic product, which means it kills bacteria on contact, eliminating the odor in the process. It is even potent enough to remove the smell associated with pet urine. You can create the following cleaning solution to spray on your carpet to eliminate any odors. Mix the two ingredients in a spray bottle until well combined. Thoroughly spray your carpet with the mixture. Scrub the carpet with a clean, soft-bristled scrub brush. This vinegar-based mix is also quite often used to get rid of urine smell in a mattress. Using a commercial carpet cleaner, add warm water to the reservoir, and clean your carpet according to the manufacturer’s instructions. Allow the carpet to dry. Thoroughly vacuum the rug to bring the texture back to normal. The acidity of lemon is more than enough to rid your carpet of strong odors. To use as a carpet cleaner mix fresh lemon juice with a bit of warm water. Using a spray bottle, or clean, dry towel, apply the solution directly to the areas of your carpet where odors linger. Scrub the area with a piece of cloth or paper towels, then rinse with soapy water. Allow the area to dry completely, then vacuum. A great way to ensure that the carpet is thoroughly dried is to place a small floor fan in the area. Tea Tree Oil is best known for its uses as a cleaning agent as well as for treating minor health and skin issues. It can be used to create a natural air freshener that can be sprayed on your carpets to help remove all the odors that linger. Pour the ingredients into a glass or plastic spray bottle and shake thoroughly until well combined. Spray the carpeting with the solution until the rug is slightly damp. Sprinkle the Borax over the carpet until you’ve covered the entire area. Allow the Borax to sit for several hours, then vacuum it up. While Borax claims to be a natural alternative to color safe bleach, it is always a good idea to perform a spot test to make sure it doesn’t discolor your carpet. Fun tea tree oil fact: Mix tea tree oil with cornstarch and baking soda and sprinkle it into your stinky shoes. It will get rid of your smelly shoes in no time. If you find that using baking soda alone doesn’t completing eliminate your carpet odors, you can create a deep cleaning treatment with a mixture of hydrogen peroxide and baking soda. To make a deep cleaning treatment, combine two tablespoons hydrogen peroxide, ¼ cup baking soda, one teaspoon liquid dish soap, and one quart of water in a large container or spray bottle. Spray or pour the solution on the carpet in an even coat. Allow the deep cleaner to sit for 24 hours. Make sure to keep it secure from kids and pets and keep the area well ventilated. Use a towel to soak up any excess liquid. If your carpet smells like smoke, you can use several bowls of ammonia to help eliminate the odor. Fill two to three containers with ammonia, leaving enough room at the top to keep it from sloshing over the sides. Place the bowls in the room where the smoke smell lingers. Allow the containers to sit, undisturbed for 24 hours. The ammonia will begin to absorb the odor. After a day, you can remove the bowls and get rid of the ammonia. Make sure to keep your children and pets away from the containers of ammonia. If your pet has had an accident on your carpet, you can use a combination of liquid dish soap, white vinegar, hydrogen peroxide, and baking soda to remove any stains and eliminate any odors. If the pet accident is recent, and the area is still wet, you’ll need to pull up as much excess urine as possible with paper towels or a clean, dry cloth. If the urine spot is old, you can clean it by mixing one cup of white vinegar and one cup water in a spray bottle. Spray the solution on the carpet and scrub the area with a scrub brush. Blot the area completely with a paper towel to absorb the solution. When the area has dried thoroughly, sprinkle some baking soda over the soiled area. Next, mix half a cup of hydrogen peroxide with a teaspoon of the liquid dish soap and pour it over the baking soda. Work the hydrogen peroxide into the area with a brush. Allow the area to dry completely, then vacuum up the baking soda. Just because you love the carpet in your home, doesn’t mean you have to live with the odor. Short of bringing in a professional to clean your carpets, you can manage the odors with these simple tips. All of these tips use everyday products that you can purchase at the grocery store. They are inexpensive and safe to use around your children and pets. 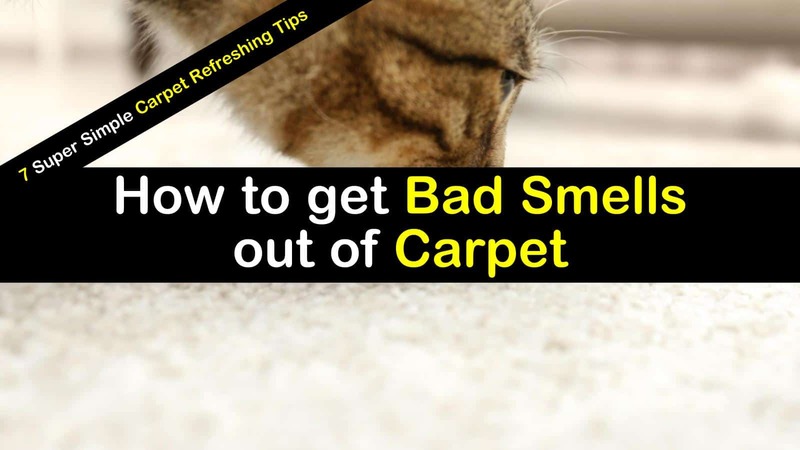 We hope you learned some easy ways to get bad smells and odors out of your carpet and hope you’ll share this article with your friends and family.